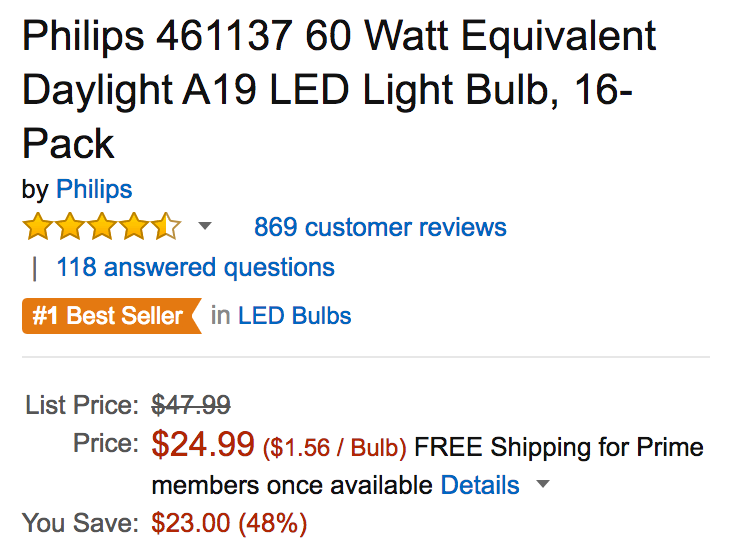 Amazon offers a 16-pack of Philips 60W Daylight A19 LED Light Bulbs for $24.99 Prime shipped. For comparison, it usually sells for around $45. Today’s deal is a match of the Amazon all-time low price. Make the switch to LED light bulbs at just $1.56 per unit. These are the #1 best selling LED products at Amazon with a 4.6/5 star rating from over 860 reviewers. Features include an A19 design, 60W of power and daylight equivalent lighting. Saving money on quality lighting doesn’t need to be expensive. With the familiar look and feel of traditional bulbs, Philips LED light bulbs are the smart and affordable alternative to the standard incandescent. Start saving now. Don’t wait for your light bulbs to burn out before you try LED. Philips LED bulbs are so affordable, you can replace the light bulbs in any and every room in your home. Philips LED light bulbs are available in a variety of color temperatures and energy saving wattages from soft white to daylight and 40 to 100 watt equivalency.